The rediscovered jewels of the Inca Empire, the magnificent scenery in the Peruvian Amazon, the mysterious Nazca Lines, and the archaeological treasures of Chiclayo and Trujillo await you on this tour through Peru. Peru is one of the great originating centers of ancient culture, and on this vacation you’ll discover its archaeological treasures, appreciate its ancient ruins, and learn about its culture. Begin with a trip to Peru’s Amazon, where you’ll discover the tropical jungle on multiple boat trips. Be on the lookout for turtles, caimans, monkeys, river birdlife, and more—not to mention the lush vegetation. Search by canoe for the resident giant river otters, and visit a Parrot Clay Lick to watch the parrots and macaws. In Lima, see vestiges of the Spanish colonial period before heading to Cusco and the Sacred Valley. See the Temple of Sacsayhuaman, which was built in the early 12th century. Some of the stones used to build the fortress weigh more than 350 tons, fit so tightly together that a piece of paper will not fit between the stones. Just ponder how it was built without the help of modern technology and machinery! While at the ruins, experience a Mother Earth Ceremony, performed by a local shaman to thank Mother Earth and to ask for good health and safe travels. 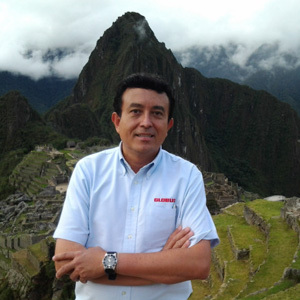 A highlight of your vacation is a tour to Machu Picchu. Stand in awe as you witness the ancient ruins surrounded by soaring peaks—one of the most majestic images in South America! No trip to Peru is complete without seeing the Nazca Lines. When seen from the air, the lines form precise geometric shapes that number in the hundreds. Archaeologists remain puzzled about why the ancient Nazca people, who thrived here from 200 BC to 500 AD, created illustrations that could only be seen from far above the Earth. To round out this Incan Empire discovery, head to Chiclayo—Peru’s Egypt—for an archaeological feast! Visit tombs dating back to 100 AD, still intact, and the ceremonial pyramids feared by many natives, who often refer to it as “Purgatory.” Not far from Chiclayo, Trujillo offers the chance to see the Sun and Moon Pyramids, and some of the oldest and largest archaeological sites in South America. Ancient ruins, fascinating culture, and captivating flora and fauna—these all await you on this wonderful Peruvian vacation. For travelers ready for a new adventure, this tour is for you! En route to Trujillo, visit EL BRUJO, a stepped pyramid believed to be used for religious ceremonies between the 1st and 7th centuries. At the museum, learn about and see the artifacts found in the tombs. Visit the SUN & MOON PYRAMIDS, the largest Pre-Columbian structures in South America, and hear how and why human sacrifice was practiced here. Continue to CHAN CHAN, a well-planned metropolis and ancient capital of the Chimu Empire. This archaeological site is characterized by very tall walls, some of which are 26 feet high, that enclose each of the 11 citadels. 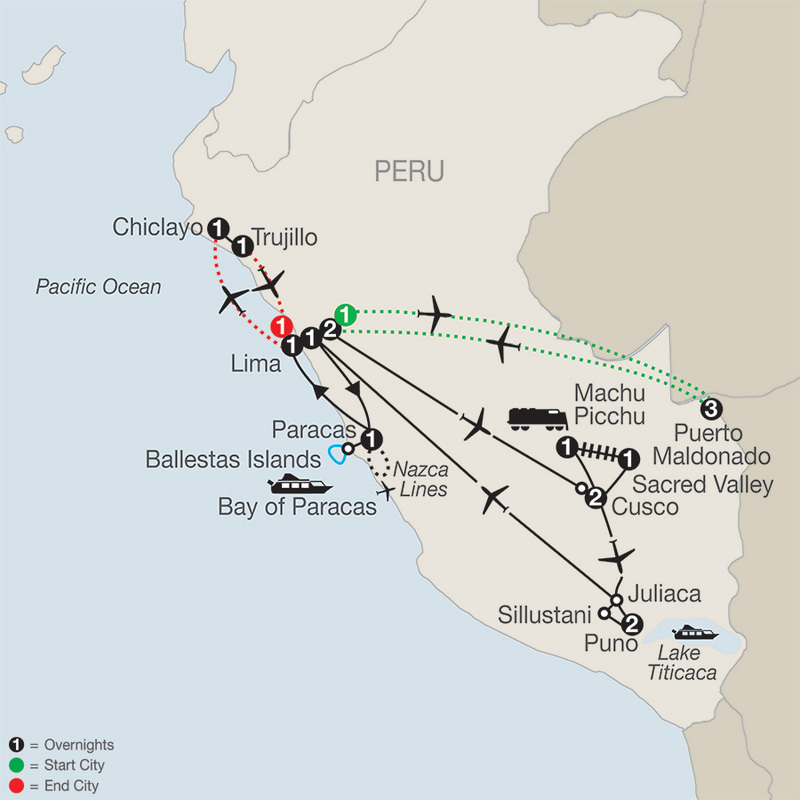 After lunch on Huanchaco Beach, transfer to the airport for your return flight to Lima.